Not much has changed for 2013 on the Lexus GX 460 SUV. There are two trim levels available: GX ($53,445) and Premium ($58,240). Our test model was the Premium version, equipped with all the standard features, plus the upgraded tri-zone A/C, automatic HID projection-beam headlights, Adaptive Front Lighting System, heated steering wheel, heated second-row seats, Adaptive variable Suspension, and electrochromic, power-retracting sideview mirrors. Options on our Premium test car included the Mark Levinson Navigation audio package ($3,930), complete with XM/Sirius, Premium Surround-sound, DVD Audio/Video, Voice Command, etc. A cargo area tonneau cover ($150), wood and leather-trimmed steering wheel ($310), and carpet mat ($60) were also included as options. One can even choose additional optional equipment, adding several dollars more. For instance, Lexus offers their Wide View Monitor System ($3,170) which includes a pre-collision system, Driver Attention Monitor, Lane Departure Alert, Intelligent High-Beam Headlamps, Dynamic Radar Cruise Control and crawl control. Also available is a less comprehensive package combo of pre-collision, intelligent headlamps, crawl control, radar cruise control and Lane Departure Alert ($2,670). 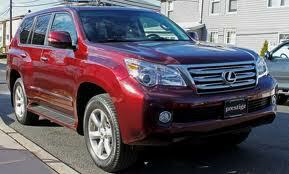 The 2013 Lexus GX 460 is much improved over previous generations. This writer can remember road tripping down to southern Indiana in the 1990s and not with especially fond memories. The ride and handling in this latest iteration is very driver friendly, making the GX one of those desirable over-the-road vehicles. As with all vehicles in this price range, the GX 460 comes equipped with the latest safety technology: advanced frontal airbags, side curtain airbags, ABS brakes, Electronic brake-force distribution (EBD), Brake Assist, three-point seatbelts for all passengers, Traction Control, Vehicle Stability Control, tire pressure monitoring system, and Smart Stop Technology (automatic reduction of engine power when brake pedal and accelerator are applied at the same time). One feature we especially covet is the cargo door which opens to the side. The window can be opened separately, providing a choice when entering the compartment. At first we had some difficulty trying to determine how to open the door, but soon located the release by pressing a hidden door handle located near the license plate. The rear windshield wiper rather than being located on the window, is placed under the rear spoiler. The third-row seats not always in use have a power fold-flat feature which is very handy when moving items. Our favorite feature, though (and this goes for Lexus sedans) is the powerful nine-speaker sound system, which as standard equipment has plenty to offer. We could drive around for hours enjoying the concert provided by the optional Mark Levinson audio. This system provides enough power to listen at very high volume w/practically no distortion or rattling speakers. Seventeen speakers and 330 watts make up the Levinson audio, which can play DVD or CDs. One never has to leave their automobile! 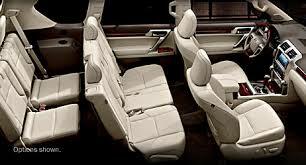 For those who are into their technology, Lexus offers its Lexus Enform, standard on the GX. Enform is subscription-based, with a live assist system that provides real-time assistance without having to program the navigation. One has only to push a button for the operator to pick up and download directions for the driver. Mind-boggling. Designed to tow up to 6500 pounds, the GX 460 has quick and precise braking (4-wheel disc). Stopping a vehicle of this weight and momentum is no small task and the GXâ€™s pedal responds well to just a light tap. Navigating corners in the GX 460 is also pleasurable. Body roll and sway is well-controlled and stability enhanced by the combination of tire/wheel. This writer did not have the opportunity to test the 2013 GS 460 off-road, although other writers did and reported excellent control over rugged terrain. Built on the same truck-based architecture as its stablemate, the Toyota 4Runner, the GX 460 is remarkably quiet and smooth on most road surfaces. A rugged and powerful large SUV, the GX has more guts than its baby brother, the RX. For those interested in taking their GX off-roading, you may want to brush up on Lexusâ€™ range (Lo, High) configuration. Entering neutral is required when accessing low range. The GX 460 is one of the few SUVâ€™s of its size that can navigate off-road terrain, due to the KDSS (Kinetic Dynamic Suspension System), an electronically-controlled system. Seating seven comfortably, the GX 460 hasnâ€™t changed much from the 2012 model. As with all Lexus products, the GX interior is luxurious and equipped with only the best: heated and ventilated seats, power moonroof, programmable lighting scheme. Of course, everything is power. Full-time four-wheel-drive is standard on the GX 460, complete with locking center differential and low-range gearing. The GX competes with the best of â€˜em, too, the Land Rover LR 4. One would be hard-pressed to find fault with the GX 460. A pleasing and desirable automobile, it is no wonder Lexus remains the benchmark. Gas tank capacity: 23 gal. EPA fuel economy: 15/20 mpg., 17 mpg.